I love old colonial hotels. While I’ve only stayed at two–the Eastern & Oriental (E&O) in Penang and the Peace Hotel in Shanghai–I’ve been fortunate to dine in several: the Raffles in Singapore, the Peninsula in Hong Kong, le Grand Hotel d’Angkor in Siem Reap, and the Nacional in Havana. I visited most of these decades after their heyday, but before massive renovations. When I stayed at the E &O in 1991, I daydreamed in the wood paneled dining room, imagining myself back in the days of Somerset Maugham as a young spinster en route to meet my fiance sent East by the Crown. The Art-Deco Peace Hotel was built in 1929 by Victor Sassoon as the Cathay Hotel. In 1995, the highlight of the Peace Hotel was the old jazz band, playing American classics while couples danced in the ballroom overlooking the Bund, minus today’s vibrant Pudong district (just cranes and building skeletons back then). The most decrepit of these old gems was le Grand Hotel d’Angkor, near Angkor Wat in Cambodia. 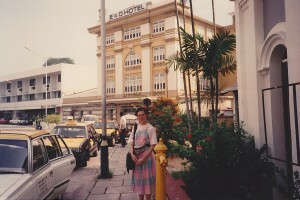 In 1991, when I ate lunch there before heading to Angkor Wat, the lonely hotel reeked of mold and moth balls. Flights to Siem Reap ran weekly, so the choice was simple–go for a week or take a day trip. Le Grand Hotel was the only place to stay in Siem Reap, so it managed to stay afloat from the few tourists who braved it for a week. My mom had stayed at le Grand Hotel 30 years earlier and as I sat on a damp cushion of a rickety rattan chair, I imagined things hadn’t changed much since then. Today I wouldn’t recognize le Grand Hotel. It’s been completely redone and goes for hundreds of dollars a night. The one hotel I never got to was the Strand in Rangoon, built by the Armenian Sarkies brothers, also the founders of the E&O. Going to Burma 20 years ago was even less inviting than getting to Siem Reap. Visas were granted for up to seven days, which was an improvement over a previous policy of letting foreigners in for only 24 hours. I wanted to visit Burma just to see the Strand. It was before e-mail and the internet, so I waltzed into Phoenix Services, my favorite travel agency in Hong Kong, and asked about Burma. “You can only go if you join a tour,” the owner told me. I normally didn’t go on tours, but would have tried it had one week in Burma not cost as much as my whole summer through Asia, Russia, and Eastern Europe. The website for the Majapahit, Surabaya is http://www.hotel-majapahit.com/ – It was originally called the Oranje, built by the Sarkies Bros c. 1910. Definitely recommended if you find yourself in downtown Surabaya (Java’s second biggest city I think). I imagine it would have been on the old road to Bali, so probably a stop off for early 20th century celebrities en route to stay with European artists Walter Spies and Rudy Bonnet who’d settled in Ubud – Charlie Chaplin, Noel Coward and H G Wells all made the trip!! 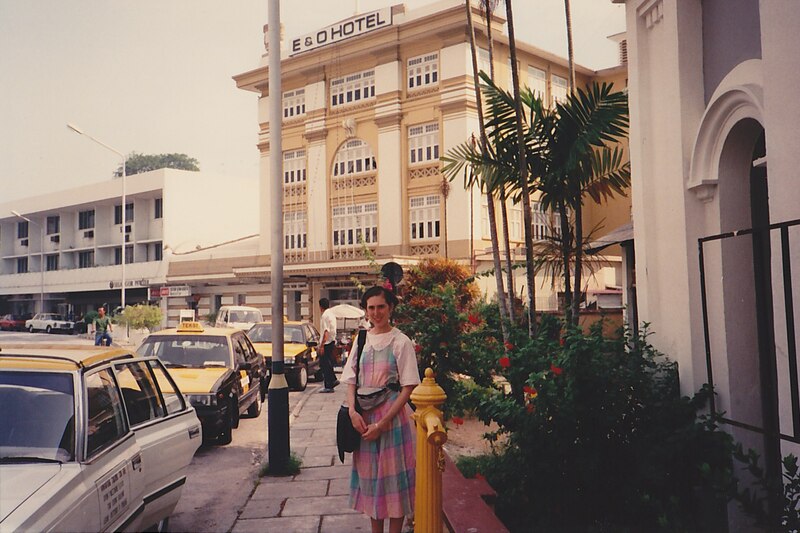 Jon & I once stayed at a stunning old colonial hotel called the Majapahit in Surabaya, on the way to a wedding in rural Java … it was built early 1900s by the Sarkies brothers who built the Raffles, the E&O and the Strand, Rangoon. Unfortunately Surabaya itself was a noisy, polluted city with little charm … but the hotel was beautiful! (I’ve also had a drink in the Rex in HCM and in the Raffles, and visited that synagogue!) I always wanted to go to the E&O one day; and the Strand – but only if the repression lets up. Another beauty where I’ve eaten but not stayed was the Bela Vista in Macau – before and after it was done up, but it was turned into a diplomatic residence last I heard. Thanks!! I had a cup of Lipton tea at the Rex and totally count it and all those other Saigon beauties as grandes dames, too. I’ve heard the Metropole in HaNoi is very expensive now!! Oh, Susan, how awesome! I have pics from atop the Peace Hotel (did not stay there). There is a Hotel Metropole in HaNoi that, while not it self being historic, is in an historic building – when I was a student at the Univ of HaNoi (Spring, ’92), several classmates and I would have Sunday brunch there. Ate at the Rex in Saigon as well, but that’s historic thanks to the war….